Passive Investing - Does it Really Mean To Do Nothing? Passive Investing is generally assumed to be an investment strategy that requires one to "do nothing." But actually, there is a great deal of work to be done in order to take advantage of using low-cost investment vehicles to help pursue your financial goals. The definition of passive, according to the dictionary, is “being inactive,” or “not acting to influence or change,” or “accepting whatever happens without response.” We’ve been conditioned to believe that through hard work and effort, most anything can be accomplished – that may be true for most things, but when it comes to investing in the capital markets, it has been proven that letting the markets work for you, or being passive, is the best alternative. Imagine you’re driving a vehicle headed down a path to your desired destination (your financial goals). The vehicle you are driving is low-cost and low-maintenance; it has been custom made according to your needs. The roads to your destination have been mapped out, and the thousands and thousands of previously driven trips have established the most effective way to reach your destination. All you should have to do is stay the course. You also realize that along the way you may have to alter your course due to a changing destination. You are also aware that you will undoubtedly confront things that are out of your control and may impede or halt your progress – bad weather, road repairs, traffic jams, or any other temporary conditions. But you still stay on the course since the evidence is overwhelming that the longer you stay on course, the greater the probability is of getting you to where you want to go and when you expect to get there. Now consider the vehicle you are driving is neither low-cost nor low-maintenance. You may be paying high fees for the vehicle, and the annual maintenance may be relatively expensive. Instead of your destination being very specific, you may have an ambiguous or vague goal of “getting to a better place,” or “doing better than everyone else.” There may be alluring detours and shortcuts that will be offered (at a cost) that can potentially speed up your trip or get you to a “better” place. But at the first sign of temporary trouble, you may ill-advisedly want to take a different path or get off the road completely. The result, unfortunately, is you may not get to your desired destination, or eventually get there, but it may take longer than anticipated. Adopting a successful passive investment strategy requires much preparation and planning to get to the point where you can put your vehicle in relative cruise control. The identification of objectives and current conditions require the ability to make forecasts, prepare net worth and income statements, and identify an appropriate level of client risk tolerance. Designing and implementing an efficient strategy requires a vast knowledge of related financial matters such as investments, tax planning, retirement planning, social security planning, estate planning and asset protection. There is nothing passive at all about what is needed to place clients in the best position to pursue goals and objectives. Once the objectives become the target, using academic evidence, straightforward common sense, and low-cost investments can help reach objectives in the most efficient manner - This is where passive investing is introduced. Passive investing amounts to tracking an index or formula as opposed to paying a human being to actively beat the market. According to the Investment Company Institute, index mutual funds and exchange-traded funds comprise almost 30% of all funds, more than double their share a decade ago and eight times the share 20 years ago. These funds represent the benchmarks that every professional money manager is trying to outperform but have collectively failed. Even if one assumes that a fund manager can match the market, all the direct and indirect costs of active management add up to over two percentage points a year, according to a study by economist William Sharpe. Performance is driving the upheaval. 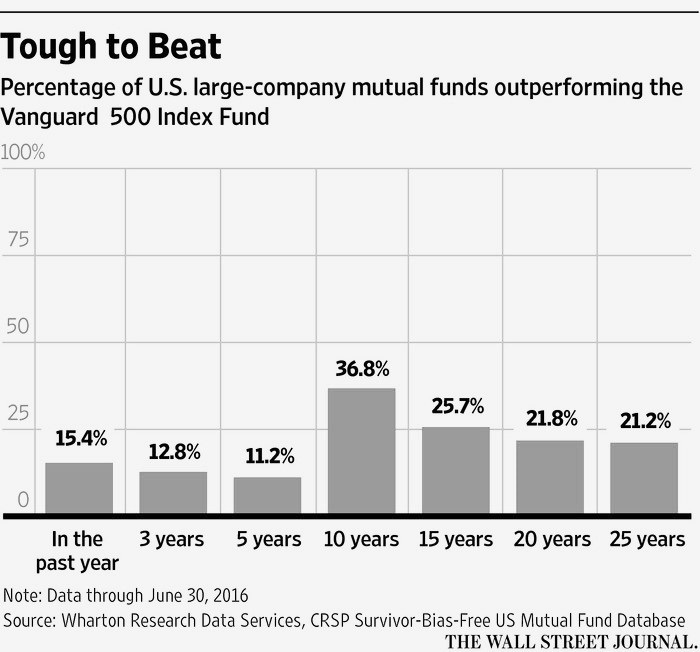 Over the decade ended June 30, between 71% and 93% of active U.S. stock mutual funds, depending on the type, have either closed or underperformed the index funds they are trying to beat, according to Morningstar. Moreover, because matching the performance of stock indexes is far cheaper than trying to beat them, index funds’ expenses are a fraction of what active funds charge—sometimes 1/30th or less. With interest rates near zero, fees stand out more than ever. Here at Carr Wealth Management, we believe long-term performance is dependent on the level of risk an investor accepts. So logically identifying the appropriate level of client risk is the challenge advisors have to helping clients pursue their financial goals. Then providing access to a more efficient way to invest allows clients to take advantage of long-term market returns without the need to incur unnecessary costs and engage in counter-productive strategies. Please take advantage of a no-charge initial consultation to find out how C.W.M. can help you adopt a more efficient investment strategy.